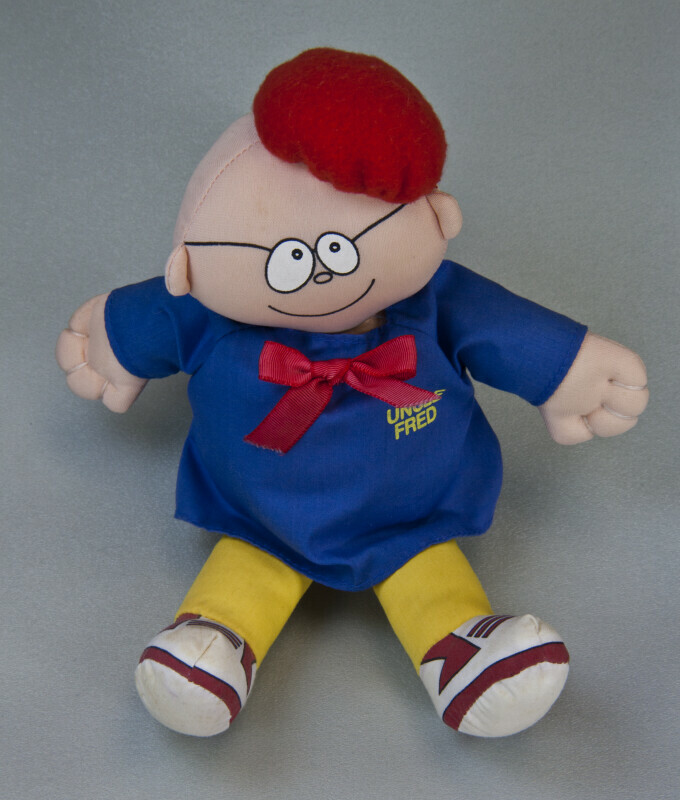 Cloth doll of "Uncle Fred", the renowned cartoonist Fred Lasswell. Fred is best known for being the artist, energy, and passion behind the cartoon strip Snuffy Smith. For approximately 50 years, Fred drew his famous characters, including Barney Google and Snuffy Smith. Fred was also committed to helping children learn to draw, and he took on the personification of Uncle Fred in a series of drawing programs for children. The doll is wearing a red beret and a blue artist smock. His face is printed on the fabric. The doll is signed "For Sweet Ann, Love Uncle Fred." The figure is 9 inches (23 cm) tall.